January 30, 2012, 3:10 PM · Perhaps Gustavo Dudamel should have his own entry in the Guinness Book of World Records: Youngest Conductor to Conduct All 10 Mahler Symphonies (by Memory) -- a feat he will complete with the performances of Symphonies 7, 8 and 9 over the next week. Maestro Dudamel turned 31 last Thursday, (they did play him a birthday tune during rehearsal) and a very large party indeed turned up on stage and off for his performance of Mahler's Symphony No. 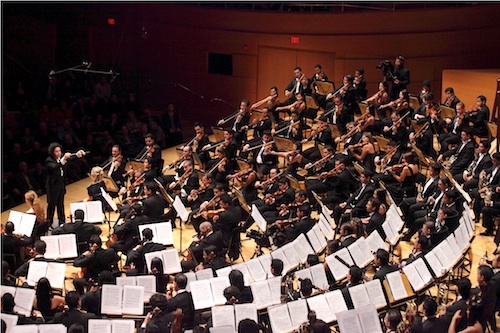 5, with the Simón Bolívar Symphony Orchestra of Venezuela, as part of The Mahler Project. Before the concert, I noticed a stack of CDs at the front of the Disney Hall gift store -- they were a recording of Dudamel conducting this same piece with the Simón Bolívar orchestra in 2007. Undoubtedly there is turnover in a youth orchestra, even one with ages spanning 18 to 28, but during the performance I sensed a certain sure footing with this piece, a bit more free and confident than the Mahler 3 I'd seen them perform a few nights before. Energy, fire, exertion -- no hesitation on this night. They seemed to share a deep communication; I had the feeling that every nod from Dudamel referenced a hundred well-discussed and rehearsed moments. Mahler 5 opens with a trumpet call and then settles into the first movement's funeral march. Overall, though, the work is fairly bright, and this performance sizzled with energy -- even during the smallest moments. During the third-movement Scherzo, there is a moment of utter silence -- with some 175 people onstage, it makes for a weighty quiet. From this nothingness blooms a rollicking dance, which pushes to a pinnacle of drama and noise. After all the bombast, the symphony turned intimate in the Adagietto -- which is likely to sound familiar even if you've never heard it. It has been used in popular culture -- in the film Death in Venice and at John F. Kennedy's funeral. The music has been imitated often, and certainly it influenced later composers. Compare it, for example, to Barber's Adagio for Strings. The Adagietto began like still water, with the harp making gentle ripples against the suspended strings. It's shimmering and beautiful, but not quite warm, not even when the violins enter with their aching melody. Dudamel kept it restrained, with the occasional brief and bright ray of sun, which then was quickly internalized. Even when reined in, the great energy of this orchestra was always at the door. The movement came to an exquisite ending -- no simple crescendo from piano to forte, imagine instead a crescendo that ascends about 45 steps of volume, followed by an equally profound denouement. Beautifully done. To begin the final movement, Dudamel cued the horn with his eyebrows. It's a swirling and playful movement, with a kind of happy fugue in the strings, which they played with great accuracy. And once again, the audience was on its feet for a good 10 minutes, with several audience members waving colorful "Venezuela" jackets for good measure.